The Animal Boarding Establishment Act 1963 requires anyone who carries on the business of a dog boarding establishment to obtain a licence to do so. Reading Borough Council has produced the following guidelines to be attached to a licence. 1.1 Unless otherwise stated, these conditions shall apply to all buildings and areas to which dogs have access and/or are used in association with the boarding of dogs. Use of the term 'kennel' refers to combined sleeping and individual exercise areas. 2.1 A copy of the licence and it conditions must be suitably to the public in a prominent position in, on, or about the boarding establishment. 2.2 The boarding establishment shall enter into a contract with a veterinary surgeon to provide 24 hour veterinary cover of the premises and all animals likely to be held thereon. Details of the surgery, method of contact and emergency protocols must all be agreed with the veterinary surgeon and displayed in the boarding establishment. Furthermore all staff, including part time staff must be trained so that they are able to contact the veterinary surgeon if any doubt arises as to an animal's health and authorised to do so if suffering is noted. 3.2.1 The establishment must, at all times, be laid out and operated in accordance with an approved plan, to be attached to the licence. Before carrying out any alterations, plans must be submitted to and approved by the licensing officer of the local authority. 3.1.2 Where wood has been used in an existing construction it must be smooth and treated to render it impervious. Wood must not be used on exposed surfaces of walls, floors, partitions, door frames or doors in the dog kennelling area. There must be no projections liable to cause injury. 3.1.3 All exterior wood must be properly treated against wood rot, e.g. tantalised. Only non-toxic products shall be used. 3.1.4 All internal surfaces used in the construction of walls, floors, partitions, doors and doorframes are to be durable, smooth and impervious. There must be no projections or rough edges liable to cause injury. 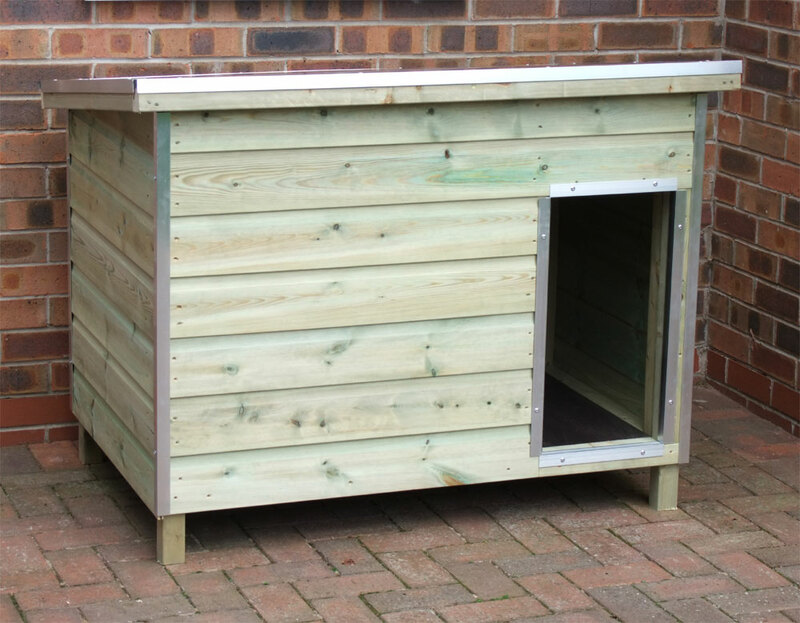 3.1.5 Sleeping areas of kennels must be insulated so as to prevent extremes of temperature. 3.1.6 The construction must be such that the security of the dog is ensured. 3.1.7 Fencing material must be secure and safe. 3.2.1 Walls which dogs may come into contact must be smooth imperious materials, capable of being easily cleaned. Where concrete or other building blocks or bricks are used, they must be sealed so as to be smooth and impervious, and resealed as necessary. 3.2.2 Junctions between vertical and horizontal sections must be covered. If impractical in existing premises, all joints shall be sealed. 3.2.3 Partitions walls between kennels and individual exercise areas must be of solid construction to a minimum height of 1.2m (4 ft). 3.2.4 In new construction, in exercise runs the lower section of partitions in adjoining runs must be of solid construction. 3.3.1 Floors of all buildings, individual exercise areas and kennels must be of smooth, impervious materials, capable of being easily cleaned. New kennels must incorporate a damp proof membrane. 3.3.3 In new constructions, floors must be laid to a minimum fall of 1 in 80 leading to a shallow drainage channel or effectively covered deep drainage channel. 3.3.4 Communal exercise areas must also be suitable drained to prevent pooling of liquids. 3.5.2 Where metal bars and frames are used, they shall be of suitable gauge with spacing adequate to prevent dogs escaping or becoming entrapped. Where metal edging is used, this must not present a risk of injury to the dog. 3.7.1 The establishment must be connected to mains drainage or an approved sewerage disposal system. 3.8.1 During daylight hours light must be provided to exercise and sleeping areas so that all parts are clearly visible. Where practicable this must be natural light. 3.8.2 Adequate supplementary lighting must be provided throughout the establishment. 3.9.1 Ventilation must be provided to all interior areas without the creation of excessive, localised draughts in the sleeping areas. 3.10.1 Maintenance and repair of the whole establishment must be carried out regularly. 4.1.1 The maximum number of dogs to be kept at any one time is[ ]. 4.1.2 Each dog must be provided with a separate kennel except that dogs from the same household may share a kennel of adequate size with written consent of the dogs' owner. 4.1.3 Holding kennels must be provided for temporarily kennelling a dog for not more than 24 hours. Holding kennels, if provided, must comply with conditions as required for main kennels. Holding kennels must be a minimum area of 2.3m2(25 ft2 ). 4.1.4 No animals other than dogs are to be boarded within the licensed facilities without the written approval of the local authority. 4.1.5 Where stray dogs are accepted by the kennels they must be kept in a separate area away from boarded dogs. 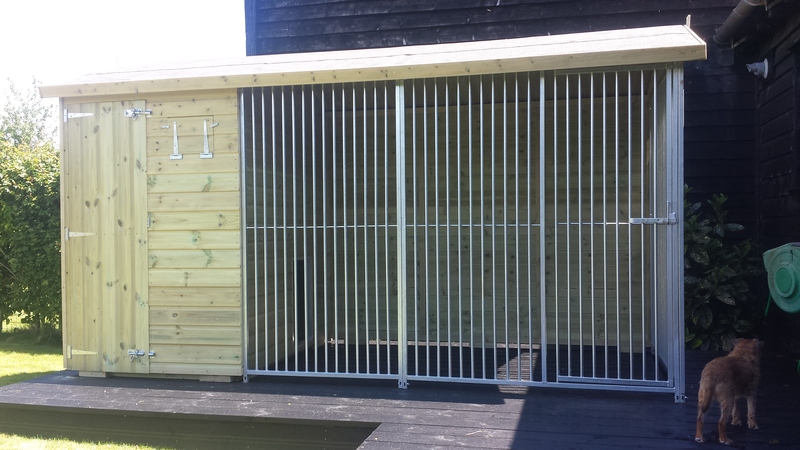 4.2.1 for new kennels each kennel must be provided with a sleeping area of at least 1.9m2 (20ft2). 4.2.2 Bedding must be suitable to allow dogs to be comfortable. Bedding must be capable of being easily cleaned and sanitised and sited away from draughts. All bedding materials in use must be clean, parasite free and dry. 4.2.3 Adequate exercise areas must be provided for all kennels. For new kennels each kennels must be provided with an exercise area of at least 2.46m2(26 ft2 ) (for dogs up to 24 inches high at shoulder) or 36 ft2 for larger dogs, which is separate from the bedding area and exclusive to that kennel, for free use by dog at all times except at night. 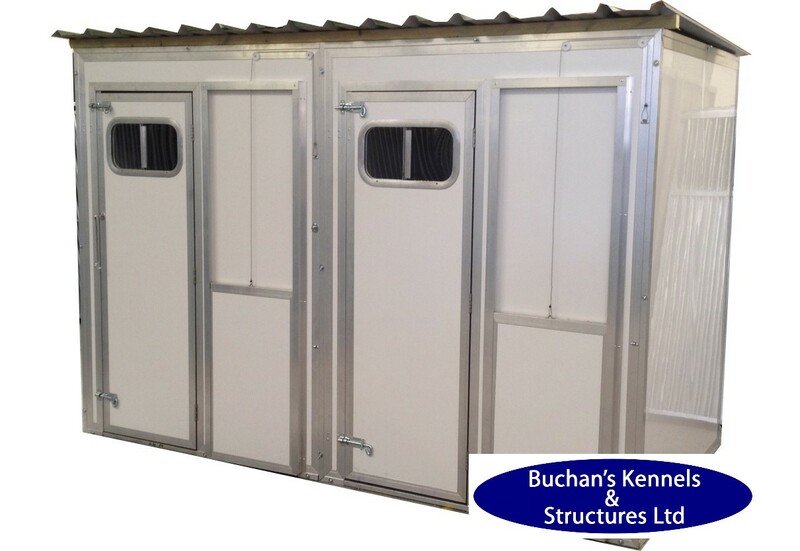 4.2.4 Kennels must have a minimum height of 1.8m (6ft) to allow adequate accessibility to kennel staff for cleaning. 4.2.5 Kennels and exercise areas must open onto secure corridors or other secure areas so that dogs are not able to escape from the premises. 4.2.6 Exercise areas must not be used as sleeping areas. 5.1.1 A written training policy must be provided. Systematic training of staff must be demonstrated to have been carried out. 5.2.1 Heating facilities must be available in the kennel and used according to the requirements of the individual dog. 5.2.2 There must be some part of the sleeping area where the dog is able to enjoy a minimum temperature of 10°C (50°F) and a maximum temperature of 26°C(79°F). 5.2.3 In isolation kennels there must be a means of maintaining the temperature at a level suitable for the conditions of the dog and dependent on veterinary advice. 5.3.1 All kennels, corridors, common areas, kitchens and so on must be kept clean and free from accumulations of dirt and dust so that disease control is maintained and the dogs are comfortable. 5.3.3 Each occupied kennel must be cleaned daily. All excreta and soiled material must be removed from all areas used by the dogs at least daily and more often if necessary. 5.3.3 Each kennel must be thoroughly cleansed, disinfected and dried upon vacation. All fittings and bedding must also be thoroughly cleansed and disinfected at that time. 5.3.4 Facilities must provided for the proper reception, storage and disposal of waste. Particular care must be taken to segregate waste arising from the treatment and handling of dogs with infectious diseases. The final disposal route for all such waste must be incineration. 5.3.5 Measures must be taken to minimise the risk from rodents, insects and other pets within the breeding establishment. Such pest must be adequately dealt with without delay to eradicate the infestation. 5.4.1 All dogs must be adequately supplied with suitable food. Wholesome water must be available at all times and changed daily. 5.4.2 Eating and drinking vessels must be capable of being easily cleansed and disinfected to prevent cross-contamination. They must be maintained in a clean condition and cleansed or disposed of after each meal. 5.4.3 Eating vessels must be cleansed after each meal. 5.4.4 Drinking vessels must be cleaned at least once a day. 5.5.1 Exclusive facilities, hygienically constructed and maintained, must be provided for the storage and preparation of food for the dogs. 5.5.2 Where fresh and cooked meats are stored, refrigeration facilities must be provided. Food contamination must be avoided. 5.5.3 A sink with hot and cold running water must be available for washing kitchen utensils and eating and drinking vessels. A separate wash-hand basin with hot and cold running water must be provided for staff use. 5.5.4 Containers for storing foods must be provided and be constructed and maintained to guard against insects and other pests. 5.6.1 All reasonable precautions must be taken to prevent and control the spread of infectious and contagious disease and parasites amongst dogs, staff and visitors. 5.6.2 Proof must be provided that dogs boarded or resident have current vaccinations against Canine Distemper, Infectious Canine Hepatitis (Canine Adenovirus), Leptospirosis (Leptospira canicola and Leptospira icterohaemorrhagiae) and Canine Parvovirus. It may be necessary to vaccinate against other diseases and veterinary advice should be sought. The course of the vaccination must have been completed at least four weeks before the first date of boarding or in accordance with manufactures instructions. A record that this proof has been supplied must be kept on-site throughout the period that the dog is boarded. 5.6.3 Advice from a veterinary surgeon must be sought where a dog shows signs of disease injury or illness. Where any dog is sick or injured any instructions for its treatment, which have been given by a veterinary surgeon must be strictly followed. 5.6.4 A fully stocked first-aid kit suitable for use on dogs must be available and accessible on the premises. 5.6.5 A suitable range of muzzles of varying sizes and suitable dog catching device must be kept on site. 5.7.1 Isolation facilities must be provided at the rate of at least one isolation kennel for up to 50 kennels. 5.7.2 Isolation facilities must be in compliance with the other licence conditions but must be physically isolated from the main kennels at a distance of at least 5 m (15 ft). 5.7.3 Adequate facilities to prevent the spread of infectious disease between isolation and other kennels must be provided. 5.7.4 Hands must be washed after leaving the isolation facilities before handling other dogs and visiting kennels. • health, welfare and nutrition requirements. 5.8.2 The register must be kept readily available for a minimum of 24 months and kept in such a manner as to allow an authorised officer easy access to such information. 5.8.3 Where records are computerised, a back up copy must be kept. The register must also be available to key members of staff of the establishment at all times. 5.9.1 Each kennel must be clearly marked (e.g. numbered) and a system in place, which ensures that relevant information about the dog in that kennel, is readily available. 5.10.1 A fit and proper person must always be present to exercise supervision and deal with emergencies whenever dogs are boarded at the premises. 5.10.2 Dogs must be visited at regular intervals as necessary for their health, safety and welfare. 5.11.1 All appropriate steps will be taken for the protection of the dogs in case of fire or other emergency. 5.11.2 There must be an emergency evacuation plan and fire warning procedure in place. This must be posted where staff may become familiar with it. This procedure should include instructions about where dogs are to be evacuated. 5.11.3 Fire fighting equipment and detectors must be properly maintained. 5.11.4 All electrical installations and appliances must be maintained in a safe condition. There must be a residual current circuit breaker system on each block of kennels. 5.11.5 Heating appliances must not be sited in a location or manner where thy may present a risk of fire, or risk to dogs. 5.11.6 Precautions must be taken to prevent any accumulation of material, which may present a risk of fire.